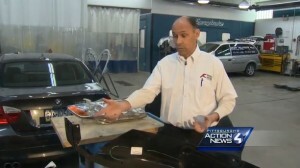 Another TV station has picked up on insurers’ requirement of used and aftermarket parts, interviewing a Pennsylvania collision repairer who has raised the issue in a lawsuit as well. The steering allegation appears strong in this case, as a customer interviewed was a repeat Kilkeary’s Auto Body patron who wanted to go there again, WTAE reported. Instead, Geico urged Adam Elias to use a “preferred provider” (presumably a direct repair program shop), according to WTAE. “They said if you want the work to be guaranteed that’s where you’ve got to go,” Elias told the station. Geico wouldn’t comment to WTAE. Kilkeary, who said he returns 90 percent of aftermarket or used parts for defects, told WTAE he fixed a fender, hood and headlight that were either aftermarket or reconditioned. The worst offender was the fender, Kilkeary said, pointing out a hood connection with half the thickness of the OEM version. Aftermarket and recycled trade groups challenged the same complaints about their parts raised in an “Anderson Cooper 360” report.